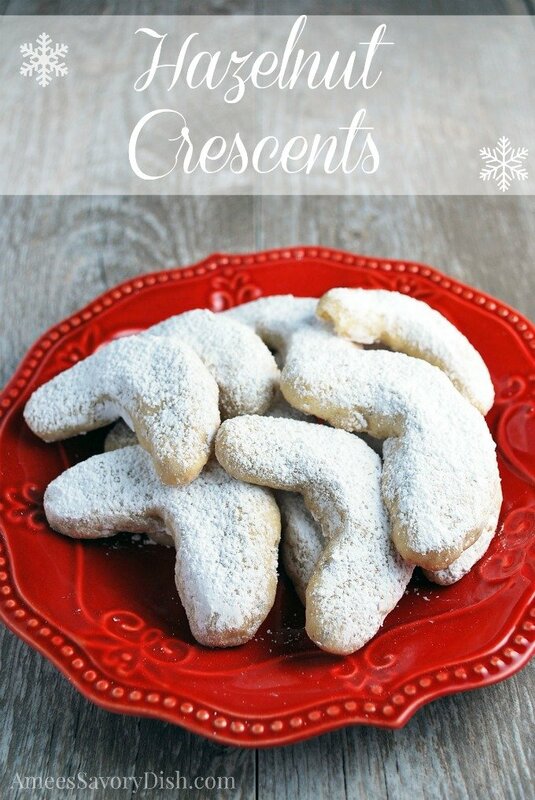 These Hazelnut Crescents are one of my favorite Christmas cookie recipes. My Nana made these every year, but she would often use walnuts. You can use any nut you love, I happen to be a big hazelnut fan. I’m thinking that these would be amazing drizzled in melted bittersweet chocolate. I should have thought of that sooner! I really miss getting my Nana’s cookie tins. She’s 95 and doesn’t cook or bake anymore, but I’m very grateful that we still have her in our lives. She’s an amazing lady. She’ll tell you that she owes her longevity to Jack LaLanne and all the exercise she did over the years. 🙂 Keep moving, ya’ll, it’s the fountain of youth! Every Christmas, when I was growing up, she would make a huge variety of cookies and package them up, beautifully arranged, in a cookie tin. That tin was such a special delivery every year. We would wait in anticipation for those treats. This old German cookie recipe was one of Nana’s yearly staples and has remained a holiday classic. There are only a few ingredients and they are really simple to make. It’s basically a shortbread with nuts and powdered sugar. Not to mention, they’re really beautiful. The powdered sugar always made me long for snow. These simple, delicate hazelnut crescent cookies that have been a special part of my family’s Christmas tradition. I hope that you enjoy the recipe as much as we do! 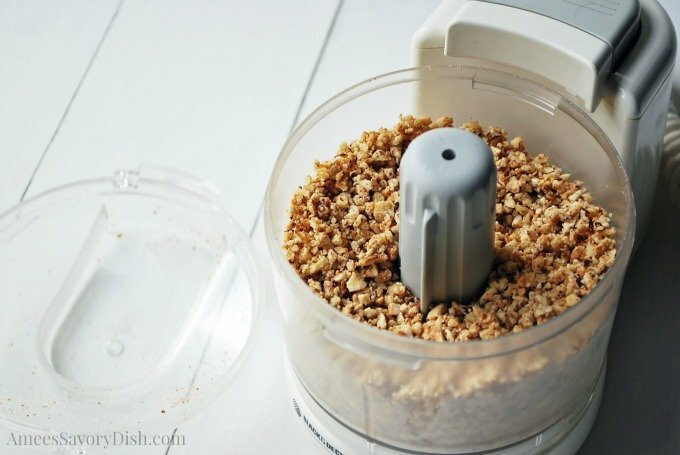 Add vanilla, flour and nuts. Scoop out 2 tsps of dough and form into a crescent shape. Repeat with remaining dough, placing about 1 inch apart on parchment-lined baking sheets. Bake for 15 minutes, they won't look browned, they should still be light in color when finished. Enter below for your chance to enter to win one of these Amazon gift cards to make holiday shopping a bit easier! Thank you for supporting my blog and don’t miss all of the other talented bloggers in today’s round-up! Happy Holidays! I love making fudge with my Nana every year. SO good! Thanks for the great giveaway! My MIL makes those cookies too, although these last couple years she hasn’t had the strength to spend all day in the kitchen like she used to. Happy Holidays to you, Biz! Love those, too! Good choice Georgette!